There are so many detergents in the market that it can be quite confusing to pick one. The October issue of ShopSmart magazine offers help. 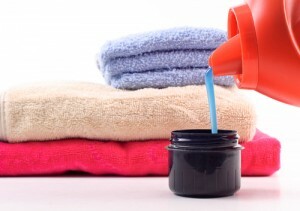 The mag lists the best detergents, as well, as the not so hot ones. Which do you prefer – powder, liquid, or pods? There are so many options! Up & Up Ultra Concentrated – It costs 10 cents per load and the powder detergent is tough on dirt, blood, and ring around the collar. I’m currently using the liquid version of this detergent and it works just as well. The powder detergent is formulated for only top-loading washers. Ultra Tide HE – It costs 16 cents per load and it’s designed for both front-loading washing machines and high-efficiency top-loaders. Ultra Tide plus Bleach – It costs 23 cents per load and it beat the competition by washing away grass, blood, and ring around the collar. Tide Pods – It costs 22 cents per load and can be used in regular and high-efficiency washers. Seventh Generation Natural Super-Concentrated – It costs 26 cents per load and it worked well at removing grass and blood. I’ve tried this detergent and particularly like the lavender scent. It’s pricey, though. Bummer. Wisk Deep Clean – It costs 17 cents per load and it’s easy to use to pre-treat stains, but it had a tough time with blood stains. ShopSmart magazine found that the following detergents did not do well at removing stains. They also claim to be eco-friendly formulations. I like doing laundry. It beats washing dishes. Check out my other tips to save money in the laundry room. Who does the laundry in your home and what’s your favorite laundry detergent? Get today’s freebies. Don’t miss out! I was wondering how the costs were determined since there are variables such as which store, what state, etc. Lately I have been purchasing laundry detergent at Costco after first consulting Consumer Reports. @Diane I use both the Costco and Target detergents depending on what store I can get to first. I also read the Consumer Reports piece on their picks for best detergent and that’s how I settled on those two. The prices are determined per load based on the detergents’ recommended amount to use. If I’m not mistaken, they’re the national average. These costs are hard to pin down because the prices vary so much between stores and sales. I recently bought four huge boxes of Country Save detergent for about $.10 per load. It’s environmentally friendly and especially good at cleaning Lucy’s cloth diapers and cloth wipes. My favorite place to shop for stuff like detergent is Amazon because of the awesome 15% subscribe and save discount. Thanks for the comparison Yazmin! People the cheapest and best laundry soap is what I make at home. I then use clean linen scent oil from Walmart. I t works wonderful and cost me roughly 67 cents a gallon. I sell it to my coworkers for $2 a gallon. Recipies can be found on any frugal living website.